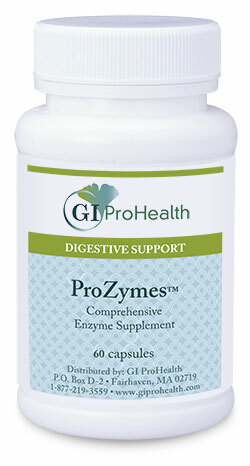 Potent, full-spectrum enzyme blend for maximal support of intestinal function. (SCD Legal product) (does not need refrigeration) This high-potency, multi-enzyme formulation offers an unusually complete range of plant/microbial-based enzymes that work in concert to help maintain normal enzyme levels that support the body’s digestive capabilities and assist intestinal repair mechanisms. The broad-spectrum combination of enzymes in ProZymes™ maximizes the breakdown, absorption, and utilization of macronutrients from the widest spectrum of foods, including proteins and protein peptides, carbohydrates, disaccharides, and sugars, lipids/fats, and vegetable fibers. As such, ProZymes™ can serve as an important dietary adjunct for individuals requiring maximal nutrient uptake and for those with compromised gastrointestinal function such as maldigestion, malabsorption, dysbiosis, or intestinal inflammation. Suggested Use For Children With Autism: As a dietary supplement start with ½ capsule at the beginning of each meal for one week then increase to 1 -2 capsules with each meal or as directed by a physician. Suggested Use: As a dietary supplement start with two capsules at the beginning of each meal or as directed by a physician. ** Peptizyme SP®, a registered trademark of Specialty Enzymes. Are the ProZymes™ SCD legal? Yes ProZymes™ are a SCD legal product. Are the ProZymes™ GFCF ? Are ProZymes™free of corn, wheat and rice ? Are ProZymes™ made for Adults and Children? No, it is not a probiotic. Do the ProZymes™ require refrigeration? ProZymes™ are stored at room temperature. How long is the shelf life of ProZymes™ chew? Shelf life is 18 to 24 months from date of purchase. As a dietary supplement start with ½ capsule at the beginning of each meal for one week then increase to 1 -2 capsules with each meal or as directed by a physician.